PTC® Instruments is a durometer manufacturer in the USA offering accredited calibration and certification services to ISO/IEC 17025. Our technicians have been factory trained and certified. We are accredited by A2LA for durometer calibration and has been audited by Nuclear facilities. PTC® also participates in round robin calibration comparison with other laboratories. Our world-class durometer calibration facility uses only NIST traceable measuring and test equipment. All Calibration Standards are traceable to the National Institute of Standards and Technology (NIST). The calibration services and reports provided will meet your ANSI, ASTM, DoD, EuroNorm (EN), ISO, ISO/IEC, MIL, and other standards, as well as proprietary inter-company standards and customer/supplier requirements. RMA (Return Materials Authorization) Form 24 Hour Rush Service Available! 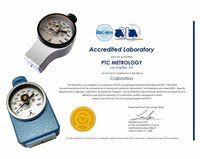 PTC Metrology™ is accredited by A2LA. Durometer calibration is done per ASTM D2240 section 7. The calibration is traceable to NIST and conforms to ISO/IEC 17025 and ANSI/NCSL Z540. A written calibration report for any durometer covered by current ASTM D2240 or ASTM F1957 specifications is available from PTC Metrology™. Each certification provides both "as received" and "as left" data. The points calibrated are normally every 10 points over the durometers scale. Certification reports are also available for DIN, JIS, ISO and proprietary standards. Other types and custom durometers can also be certified including durometers from other manufacturers. The calibration intervals are to be determined by the owner or customer of the unit under test. Unless otherwise requested the calibration interval on your durometer will be one year. Several factors should be taken into consideration such as: the required accuracy vs. the instruments accuracy, the impact an out of tolerance reading will have on the process, and the performance history.